We make it easy by providing multiple options to make paying convenient. The flexibility to pay is at your fingertips with a variety of payment types. Simply enroll using our Auto app, online Payment Portal or call us at 877-722-7299. We accept Visa, MasterCard, Discover and electronic checks. Third-party fees apply with these options. MoneyGram ®: Find a locationfor MoneyGram (opens in a new tab) near you and use receive code 2731. Western Union ®: Find a locationfor Western Union (opens in a new tab) near you and use receive code REGA, NC. If you're unable to make your monthly payments, we're here to help. Promise to Pay can offer some flexibility so you avoid late payments. Before your next due date, call us for payment options at 877-722-7299. Find answers to frequently asked payment questions. 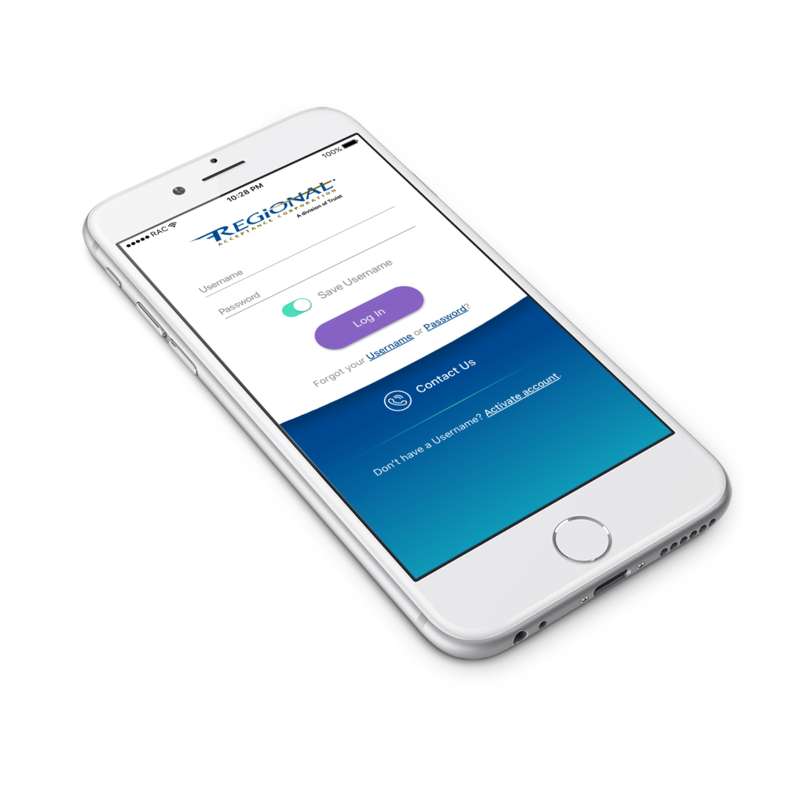 Your payoff amount can be found in our Auto app, the Payment Portal on the account information page, on your monthly billing statement or by calling our 24/7 automated assistance at 877-722-7299. Are there penalties for paying off my account early? No. There are no penalties for making payments early or paying off your account early. Where can I send my payoff amount? Please use the appropriate address for your chosen delivery method. Can I make a payment at a BB&T bank because RAC is an affiliate? No. However, there are a variety of other payment options. Can I be notified by email when payments are due? Yes. Log in to your account where you can enroll in eStatements by choosing Go Paperless Now to enroll in electronic statement notification. Find answers to frequently asked Auto Pay questions. Once you sign up, we'll automatically deduct the exact amount you entered from your designated account on your draft date each month. Why should I sign up for Auto Pay? You'll no longer have to write a check each month for your auto payment, and you’ll have peace of mind knowing that your payment is being made automatically, on time and through a secure method. Does Auto Pay cost anything? There's no charge to set up or use Auto Pay. How can I set up an Auto Pay or my payment? You can set up an automatic monthly draft to debit your bank account on or before your due date by logging in to our Auto app or Payment Portal. Allow 5 business days prior to your requested draft date to process your request. There is no fee with this payment option. How close to my payment due date can I set up Auto Pay? Please allow 5 business days prior to your requested draft date to process your request to help ensure your payment isn't late. To avoid late payments if you change banks/accounts, you can easily and securely manage your Auto Pay account information by logging in to the RAC Auto app, Payment Portal or by contacting us by phone. Can I set my draft up for more than my monthly payment amount? Yes. You can set you your draft for amounts above your minimum monthly payment. How do I cancel or change my Auto Pay? You can make changes to your Auto Pay in our Auto app, through the Payment Portal or by calling us at 877-722-7299.